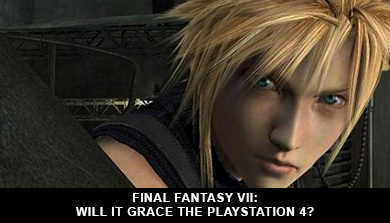 » Final Fantasy VII: Will It Grace The Playstation 4? I know that the majority of us Final Fantasy fans out there would kill for a re-make of Final Fantasy VII. As much as I would love a re-make of Final Fantasy VII, I hate to say this, but it is looking really unlikely. Square Enix themselves earlier this year have said that they will not re-make Final Fantasy VII until a newer Final Fantasy beats it in terms of quality... and sales. The and sales is the real key part of the comment for me. And to be honest I did not like it as it felt like they were blaming us gamers for not going out there and buying five copies of Final Fantasy XIII and XIII-2 each. Still though it was recently released that Square Enix’s profits were considerably down this year mainly due to the not so hot sales of there games. So what could Square Enix do to make themselves some money. Re-make Final Fantasy VII. We were cruelly teased with a Final Fantasy VII tech demo showcasing what Final Fantasy could look like on the PlayStation 3. Now to be fair at no point in time did Square Enix say that this was a preview of a game in development they were brutally honest with telling us it was just a tech demo showcasing what the Playstation 3 could do. Still many people (my self included) got our hopes up really sky high that they were just trying to keep this re-make all hush hush. The reason that I feel that so many of us love Final Fantasy VII is really quite simple. The story. I loved the world and the characters of Final Fantasy VII. And while I am not a and I hate to use the term graphics whore. Final Fantasy VII has really not aged well from a presentational point of view. I think that the core game play is fine. And I recently played through it again on the PSN ( I am embarrassed to say how many times I have played through it now!) and I love the game play it feels just so simple compared to what many RPG’s will throw at us these days. I guess that is the big question in regards to a remake isn’t it? I know that peoples opinions were really split on Final Fantasy XIII, but even the most hardened hater must admit the game looked phenomenal. Graphics are not a issue for Square Enix. The big issue will be what kind of game play style will they go for? Do they stick with the original Final Fantasy VII game play mechanics. I love everything about the game, but I must admit its infuriating when you are just about to leave a area and are hit with a random battle. Would younger gamers who have perhaps heard of the greatness of Final Fantasy VII, but never played it be put off by random battles? Of course they very well may decide that if they do re-make Final Fantasy VII that they will just use the existing game engine that they have used for Final Fantasy XIII. They spent a ton of money making that game so it makes sense that they would want to use the game engine as much as possible, but by doing this they are probably going to upset a great deal of people who like the old style Final Fantasy. When you think about it from a game play point of view they really are in a tough position. Kind of a damned if they do and damned if the don’t situation. For me personally I would want them to keep the core game play the same way that it was back in 1997. Yet I am sure there will be another person out there who feels it has aged horribly from a game play point of view and want it updated. The other question of course is how would they release this game? Final Fantasy VII as far as I am concerned is a icon of the original PlayStation. So I really do believe that if there was to be a killer console exclusive in the next generation that Final Fantasy VII would be a huge coup. Just think about how much of a huge deal it was when Final Fantasy VII was announced to be released on the PlayStation instead of the Nintendo 64. I think the same thing could happen here, but there is one big draw back and that is money. I am not putting down Square Enix for wanting to make money they are a business after all. But would it make sense from a financial point of view to not release this game on the next Xbox or even the Wii U? So what about you guys what are your thoughts on a Final Fantasy VII re-make? Would you want one? What changes would you like? And do you think there is any chance it could be a PlayStation 4 exclusive? Final Fantasy X HD was announced a while back for the Playstation 3 and Playstation Vita, but then things went really quiet. Many people simply thought that the game had been canned. I mean this is Square Enix we are talking about here, so that would not surprise me. Anyway, in recent weeks we have seen much more information released about Final Fantasy X HD. The information is very good, and it sounds like they are going all out for this HD port. To me this is amazing news for two reasons. First of all I am a huge Final Fantasy X fan, and secondly if this does well, then who knows it may make Square Enix think that maybe they should give the fans a re-make of Final Fantasy VII after all. Final Fantasy - Real Hero? Hands down Final Fantasy 7 re make should premiere on the Playstation 4 console! I have always thought that PS was the best console I have ever bought just because of FF7. I wouldn't change anything about the concepts of FF7....just add some extra weapons to strategically put down. The Limit breaks should be articulated as well as the summons. I think they should release it on PS3 as well, not all of us can put out 1500 dollars, or however much they will start for, and it will kill me if I can't play this game. Perhaps debut it on the Ps4 but release a Ps3 version as well? I really hope so! No....At least not for now. I must admit Final Fantasy VII was my first Final Fantasy game in the series. I loved the gameplay mechanics and the storyline that made a 7 yr old and his older sister stay up late on a saturday night trying to beat the next boss and understand Sephiroth's motives. However, one thing is clear: the prediction of Square Enix has merit. It took me years to even play another Final Fantasy game and not compare it to VII. Due to this I was close-minded and never gave the other games the chances they deserve. What I believe is that Square Enix wants new gamers to the Final Fantasy series to have the experience that VII gave us. As mentioned above it is not the gamer's fault for not deciding to buy 5 copies of Final Fantasy XII and XII-2, however we all in some form or another compare the next Final Fantasy to VII. In terms of sales and quality my opinion is that the constant comparisons (and thus lower inclination to buy or be interested in a newer Final Fantasy without comparing it to VII) will always set the company back in terms of making a remake. Lets look at the timeline of Final Fantasy Remakes. The first Final Fantasy did not receive a remake until 2000 (and it was made in 1987). Around that time Final Fantasy VIII was released and sales were up. This technically made the company possible to create a remake. I want to say that it is not the gamers fault but at the same time.....it sorta is. We need to give the games a chance before we throw them aside and call them garbage. It is even stated by Square Enix (and I am paraphrasing), the sole reason why Final Fantasy XIII's character Lightning (Clare) Farron is similar to our beloved Cloud Strife is to get fans to get used to idea there is another Final Fantasy. It is stated by Naoshi Mizuta the theme Unseen Abyss was meant to surpass One-Winged Angel. Again, to get us to actually be less inclined to constantly compare to VII. I am certain there are more people who may share my viewpoint (and possibly word it better) but until then this is my opinion. If square wants/needs to make money,it would be an extremely wise move to bite the bullet,and sink their funds into an updated version of ff7. They would make far more in sales than they would spend making the game. Like the author stated,using their current engine,and combining gameplay elements of current ff games,with the amazing plot and storytelling could potentially even change the face of gaming (again). Imagine just how high they could set the bar of a quality game,and how great games from other developers could be,if they were trying to keep pace... We all win. Yep I agree, Luminous FFVII please, plus more! I definitely agree with this, well I'd love to see a series of these games. If the up to date specs of PS4 from rumours are true then something similar in appearance to Advent Children could be made, while maybe not quite on the level of fidelity of that movie in HD, but considering how good graphics are in Agni's Philosophy I could definitely see something close being possible (pre-rendered & rendered on the fly always have a slight difference in appearance, but the level of detail could be similar). Sqaure could expand the story further, it'd be amazing if done well. Now I say this as a lover of all the Final Fantasy games. Though I'm on the fence about this. As where yes XIII was good and XIII-2 wasn't bad I thought it could've been better. Comparing them not against VII, that is too harsh of an action to do. I compared it to X. Final Fantasy X, rated lower in aspects next to VIII and IX, it could never compete with VII either. Still, it is a good basis to go off of. When you think of Final Fantasy it's adventure, saving the world from some all powerful evil yet I see it more and more that RPG's of today are losing their edge. Final Fantasy is no different. So here is my proposition to Square-Enix. If you want us to buy a new game made by you then make it worth our while. Give us something spectacular. I mean you now have no limitations, so give us what we've been wanting for years. Do what even Final Fantasy VII couldn't do. Then watch your sales go through the roof. After that listen to your fans and remake VII. When I heard that they were possibly remaking Final Fantasy X I was excited. So please if you want better results, then make a better game. I so hope they make it for playstation 3 or 4 it would be so amazing. FFVII was my favorite of all of the Final Fantasy games. Cause of the story and the characters. Its one of my all time favorites hands down. Don't know if any of you played crisiscore. but that "technical demo'. is the ending scene of the game crisiscore. you have to wait a while after the finish but then this scene comes allong. I really hope that they wil make a re-make. The Game North America got was not the full game. It was cut up. Yes, I would love to see a complete version of this beoved game. Its stupid of them not make one. It is going to have an automatic sale. After Playing ff12, 13, and 13-2 its not likely they can match or equal FF7 on the grounds the current people are either crippled by Enix or have no clue how to make a game. Its not rocket science every one loved seven man... The story was crazy the characters awesome and the materia an fighting style simply the best and easiest. Best game ever stabds toe to toe with occarina of time. You don't see nintendo changing link so why are these idiots not moving forward with seven remake or take up where the game left off. I mean if they want to make money sell the dam game. And news flash the other final fantasies have sucked so thats why they cant compair 12 was like watching a movie with fights in between lame just do what you did back then and quit screwing around. I got this game and a ps1 on my 10th birthday and have played it over 20 times through. it will always be the greatest rpg of all time. In this world of constant crisis only a return to turn-based rpgs can bring the ultimate solace. I pray for an updated version of this game only if the integrity of the game, its gameplay and battle structure, are preserved. Please Squaresoft (square-enix)you owe it to us, the people. Lets just forget it people. We are never going to get a remake of Final Fantasy VII. They obviously don't want to remake it. Square Enix thinks we are a bunch of lambs. Do they really think we all are going to run out and purchase every one of their games from here on out 2 to 3 times each? It's not going to happen, especially when they put out 2 - 3 games a year. Every new Final Fantasy gets worse than the last. used to be my favorite franchise. As much as I'd like to see a remake, I think there are a number of ways for it to go. How? The battle system, if they don't find a way to keep the old system yet add some new interesting elements to it then it might not be as fun. The last Final Fantasy game I played was XII and I didn't really care for XII, the storyline was forgettable and the game could play itself, the only thing that was required of the gamer as to move around and find enemies. However I will say that XII a nice break from the random battle system which can get irritating when your more focused on getting to the next destination rather than lvl up. I haven't played XIII or XIII-2, mostly a budgeting issue nothing against the games. However I did see the videos of them and as far as their stories go I wasn't too impressed with them. However I did like Lightning since my favorite FF character archetype are the brooders who aren't happy-go-lucky. That's why I didn't care for Tidus that much. That's just my own preference though, I know a fair amount of people who don't like that archtype. Which brings me to my next point, being able to influence the main character and how they act. I think if SE wants to out sale FFVII then they are going to have to do something they've never done before. Make it so that you can create your own character and make them act the way you want them to act. If SE incorporated something like that then I'd be willing to forget a remake or at least wait longer for one. That's my advice to Square Enix, focus more on letting the players fall into the role of the main character. It would sell more copies then any other game ever. Well, my first FF game was FF8. I fell in love with that game and was hooked on Final Fantasy forever. Later I found FF7 and the story line was the best. But when I buy Final Fantasy Games I remember that each is separate, with exception to X-2 and XII-2 of course. FF7 will always be my main favorite but I loved 8, 10, 10-2, 13, and 13-2 as well. Just because all of the other story lines differed from FF VII and the characters had personalities that we weren't expecting doesn't mean that the newer games were awful, just that we need to be open minded, accept the new characters for themselves and stop trying to turn them into FF VII carbon copies. Seriously, would you really want to play a series of games with different story lines featuring the same characters. No. That's why every gamer has a collection of games and not 500 copies of the same game. With that said, we also have to remember that technology is always advancing, and because of that games are going to change dramatically as time goes along. No matter how many times I pick up my FF games and play them, taking the time to get used to the subtle differences in each games' battle interface, or customization options, or menu accessibility. (Lol switching between the FFs rapidly can be very entertaining. Such as using triangle to access your menu all day and then switching to a different FF only to continue trying to press triangle when its now circle. )My point is learn to love each FF game for what is there. Don't rip it apart because its not FF VII. You're only messing up your enjoyment of the game that way. Beyond that, hell yeah I'd love to see them remake FF VII for the PS3, the PS4, or both. Lol if they did launch PS4 with FF VII I'd buy the friggin system on the spot. But if they did remake it the only thing I'd want upgraded is the graphics. We all love the game just as it is, there's no need to upgrade the battle system, change the menu options, add scenes, or anything else that would screw with the beloved game that we all hold dear to our hearts. If SE was going to remake the game I'd tell them to keep I just the way it was with just an upgrade to the graphics, because we loved it then and we'd love it just as much now. Lol I also wouldn't mind if they suddenly came out with another continuation, a game of advent children, and perhaps another beyond that. Lol, I'd survive without it but...you gotta admit it would be pretty tight to be able to play out a couple of those scenes. At any rate, that's my opinion, like it, hate it, its still gonna be the same lol. The best game handz down!! !